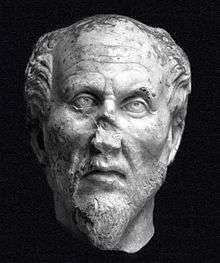 Plotinus (/plɒˈtaɪnəs/; Greek: Πλωτῖνος; c. 204/5 – 270) was a major Greek-speaking philosopher of the ancient world. In his philosophy there are three principles: the One, the Intellect, and the Soul. His teacher was Ammonius Saccas and he is of the Platonic tradition. Historians of the 19th century invented the term Neoplatonism and applied it to him and his philosophy which was influential in Late Antiquity. Much of the biographical information about Plotinus comes from Porphyry's preface to his edition of Plotinus' Enneads. His metaphysical writings have inspired centuries of Pagan, Christian, Islamic and Gnostic metaphysicians and mystics. Plotinus had an inherent distrust of materiality (an attitude common to Platonism), holding to the view that phenomena were a poor image or mimicry (mimesis) of something "higher and intelligible" [VI.I] which was the "truer part of genuine Being". This distrust extended to the body, including his own; it is reported by Porphyry that at one point he refused to have his portrait painted, presumably for much the same reasons of dislike. Likewise Plotinus never discussed his ancestry, childhood, or his place or date of birth. From all accounts his personal and social life exhibited the highest moral and spiritual standards. Porphyry subsequently went to live in Sicily, where word reached him that his former teacher had died. The philosopher spent his final days in seclusion on an estate in Campania which his friend Zethos had bequeathed him. According to the account of Eustochius, who attended him at the end, Plotinus' final words were: "Strive to give back the Divine in yourselves to the Divine in the All." ["The Six Enneads" translated by Stephen Mackenna and B. S. Page.] Eustochius records that a snake crept under the bed where Plotinus lay, and slipped away through a hole in the wall; at the same moment the philosopher died. His "One" concept encompassed thinker and object. Even the self-contemplating intelligence (the noesis of the nous) must contain duality. "Once you have uttered 'The Good,' add no further thought: by any addition, and in proportion to that addition, you introduce a deficiency." [III.8.11] Plotinus denies sentience, self-awareness or any other action (ergon) to the One [V.6.6]. Rather, if we insist on describing it further, we must call the One a sheer potentiality (dynamis) or without which nothing could exist. [III.8.10] As Plotinus explains in both places and elsewhere [e.g. V.6.3], it is impossible for the One to be Being or a self-aware Creator God. At [V.6.4], Plotinus compared the One to "light", the Divine Nous (first will towards Good) to the "Sun", and lastly the Soul to the "Moon" whose light is merely a "derivative conglomeration of light from the 'Sun'". The first light could exist without any celestial body. The One, being beyond all attributes including being and non-being, is the source of the world—but not through any act of creation, willful or otherwise, since activity cannot be ascribed to the unchangeable, immutable One. Plotinus argues instead that the multiple cannot exist without the simple. The "less perfect" must, of necessity, "emanate", or issue forth, from the "perfect" or "more perfect". Thus, all of "creation" emanates from the One in succeeding stages of lesser and lesser perfection. These stages are not temporally isolated, but occur throughout time as a constant process. Later Neoplatonic philosophers, especially Iamblichus, added hundreds of intermediate beings as emanations between the One and humanity; but Plotinus' system was much simpler in comparison. The One is not just an intellectual conception but something that can be experienced, an experience where one goes beyond all multiplicity. Plotinus writes, "We ought not even to say that he will see, but he will be that which he sees, if indeed it is possible any longer to distinguish between seer and seen, and not boldly to affirm that the two are one." Superficially considered, Plotinus seems to offer an alternative to the orthodox Christian notion of creation ex nihilo (out of nothing), although Plotinus never mentions Christianity in any of his works. The metaphysics of Emanation, however, just like the metaphysics of Creation, confirms the absolute transcendence of the One or of the Divine, as the source of the Being of all things that yet remains transcendent of them in its own nature; the One is in no way affected or diminished by these emanations, just as the Christian God in no way is affected by some sort of exterior "nothingness". Plotinus, using a venerable analogy that would become crucial for the (largely Neoplatonic) metaphysics of developed Christian thought, likens the One to the Sun which emanates light indiscriminately without thereby diminishing itself, or reflection in a mirror which in no way diminishes or otherwise alters the object being reflected. The first emanation is Nous (Divine Mind, Logos, Order, Thought, Reason), identified metaphorically with the Demiurge in Plato's Timaeus. It is the first Will toward Good. From Nous proceeds the World Soul, which Plotinus subdivides into upper and lower, identifying the lower aspect of Soul with nature. From the world soul proceeds individual human souls, and finally, matter, at the lowest level of being and thus the least perfected level of the cosmos. Despite this relatively pedestrian assessment of the material world, Plotinus asserted the ultimately divine nature of material creation since it ultimately derives from the One, through the mediums of nous and the world soul. It is by the Good or through beauty that we recognize the One, in material things and then in the Forms. Overall, happiness for Plotinus is "...a flight from this world's ways and things." (Theat 176AB) and a focus on the highest, i.e. Forms and The One. Plotinus seems to be one of the first to argue against the still popular notion of causal astrology. In the late tractate 2.3, "Are the stars causes? ", Plotinus makes the argument that specific stars influencing one's fortune (a common Hellenistic theme) attributes irrationality to a perfect universe, and invites moral turpitude. He does, however, claim the stars and planets are ensouled, as witnessed by their movement. At least two modern conferences within Hellenic philosophy fields of study have been held in order to address what Plotinus stated in his tract Against the Gnostics and whom he was addressing it to, in order to separate and clarify the events and persons involved in the origin of the term "Gnostic". From the dialogue, it appears that the word had an origin in the Platonic and Hellenistic tradition long before the group calling themselves "Gnostics"—or the group covered under the modern term "Gnosticism"—ever appeared. It would seem that this shift from Platonic to Gnostic usage has led many people to confusion. The strategy of sectarians taking Greek terms from philosophical contexts and re-applying them to religious contexts was popular in Christianity, the Cult of Isis and other ancient religious contexts including Hermetic ones (see Alexander of Abonutichus for an example). The Neoplatonic movement (though Plotinus would have simply referred to himself as a philosopher of Plato) seems to be motivated by the desire of Plotinus to revive the pagan philosophical tradition. [note 7] Plotinus was not claiming to innovate with the Enneads, but to clarify aspects of the works of Plato that he considered misrepresented or misunderstood. Plotinus does not claim to be an innovator, but rather a communicator of a tradition. Plotinus referred to tradition as a way to interpret Plato's intentions. Because the teachings of Plato were for members of the academy rather than the general public, it was easy for outsiders to misunderstand Plato's meaning. However, Plotinus attempted to clarify how the philosophers of the academy had not arrived at the same conclusions (such as misotheism or dystheism of the creator God as an answer to the problem of evil) as the targets of his criticism. The emperor Julian the Apostate was deeply influenced by Neoplatonism, as was Hypatia of Alexandria, as well as many Christians, most notably Pseudo-Dionysius the Areopagite. St. Augustine, though often referred to as a "Platonist," acquired his Platonist philosophy through the mediation of the Neoplatonist teachings of Plotinus. The Eastern Orthodox position on energy, for example, is often contrasted with the position of the Roman Catholic Church, and in part this is attributed to varying interpretations of Aristotle and Plotinus, either through Thomas Aquinas for the Roman Catholics or Gregory of Nyssa for the Orthodox Christians. In the Renaissance the philosopher Marsilio Ficino set up an Academy under the patronage of Cosimo de Medici in Florence, mirroring that of Plato. 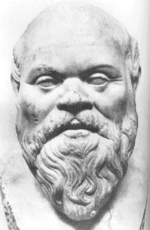 His work was of great importance in reconciling the philosophy of Plato directly with Christianity. One of his most distinguished pupils was Pico della Mirandola, author of An Oration On the Dignity of Man. Our term 'Neo Platonist' has its origins in the Renaissance. 9. The false other-worldiness of the Gnostics leads to immorality (Enneads ch. 15). ↑ "... as Plotinus had endeavored to revive the religious spirit of paganism". 1 2 3 Stanford Encyclopedia of Philosophy Plotinus. ↑ "Plotinus." The Columbia Electronic Encyclopedia, Sixth Edition. Columbia University Press, 2003. ↑ "Plotinus." The Concise Oxford Companion to Classical Literature. Oxford University Press, 1993, 2003. ↑ Bilolo, M.: La notion de « l’Un » dans les Ennéades de Plotin et dans les Hymnes thébains. Contribution à l’étude des sources égyptiennes du néo-platonisme. In: D. Kessler, R. Schulz (Eds. ), "Gedenkschrift für Winfried Barta ḥtp dj n ḥzj" (Münchner Ägyptologische Untersuchungen, Bd. 4), Frankfurt; Berlin; Bern; New York; Paris; Wien: Peter Lang, 1995, pp. 67–91. ↑ Porphyry, On the Life of Plotinus and the Order of His Books, Ch. 3 (in Armstrong's Loeb translation, "he became eager to make acquaintance with the Persian philosophical discipline and that prevailing among the Indians"). ↑ Porphyry, Vita Plotini, 9. See also Emma C. Clarke, John M. Dillon, and Jackson P. Hershbell (1999), Iamblichus on The Mysteries, page xix. SBL. who say that "to gain some credible chronology, one assumes that Ariston married Amphicleia some time after Plotinus's death"
↑ Plotinus (1950). The philosophy of Plotinus: representative books from the Enneads. Appleton-Century-Crofts. p. vii. Retrieved 1 February 2012. ↑ E. R. Dodds, 'The Parmenides of Plato and the Origin of the Neoplatonic One,' The Classical Quarterly, v. 22, No. 3/4, 1928, pp. 129-142, esp. 140. ↑ Philip Merlan, From Platonism to Neoplatonism (The Hague: Martinus Nijhoff, 1954, 1968), p. 3. ↑ Detlef Thiel: Die Philosophie des Xenokrates im Kontext der Alten Akademie, München 2006, pp. 197ff. and note 64; Jens Halfwassen: Der Aufstieg zum Einen. 1 2 Heinz Halm, Shi'ism, Columbia University Press, 2004, p. 176. 1 2 Heinz Halm, Shi'ism, Columbia University Press, 2004, p. 177. Gerson, Lloyd P. "Plotinus". Stanford Encyclopedia of Philosophy.